Now, in Windows 7 OS, you could manage your active windows in a pretty effective way with the help of a new feature named as Aero Snap. Aero Snap permits the user to maximize the window automatically by simply dragging a window to the top of the screen. User can also utilize the left or right side of the screen to resize the window to fill up and automatically take the half screen estate on the moved side. Aero Snap is absolutely a welcoming feature for those users who need to quickly half-maximize or maximize the windows for presentation or comparison. However, some Windows 7 users may have different behavior and needs. Some of them may require to always dragging a window to the frame of the desktop to work on other tasks and some may just need to examine and look at the some small corner portion of the window. For disabling or switching off Aero Snap function for auto maximizing or auto arranging window while dragging, use the trick below. First of all, go to Control Panel. Now Click on Ease of Access Center icon or Ease of Access link. 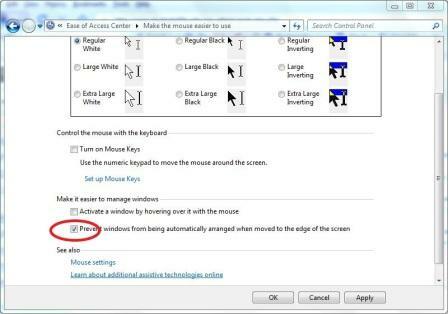 Choose option Make the mouse easier to use or Change how your mouse works. Mark the check box for Prevent Windows from being automatically arranged when moved to the edge of the screen through the mouse under the section of “Make it easier to manage windows”. Finally Click Apply or OK to save the changes effectively.